It seems as though dogs are getting cancer at younger and younger ages. My dearest friend’s dog was diagnosed with cancer at 3 – thankfully it was easily removed and she is now a grande dame at 15. However, another woman recently told me of how her 5 year old Golden passed away from cancer and my heart broke for her. It’s ALWAYS too early to loose your dog, but the idea that you don’t even get to 10 is simply unbearable. 2 Million Dogs is an organization whose mission is to discover the causes of cancers and their common link in both pets and people. 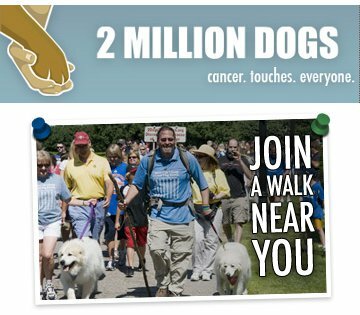 2 Million Dogs was sparked by a Luke Robinson who embarked on a walk from Austin, TX to Boston, MA – along with his two dogs – after being inspired by the loss of his Great Pyrenees to cancer. Luke and his dogs built a nationwide grassroots movement as they walked from town to town sharing Malcolm’s story and educating people about cancer in dogs. Since that first walk they’ve had hundreds of events across the country that to draw attention to canine cancer and raise funds for research. This Saturday, September 29th in Issaquah, WA there will be a 2 Million Dogs Puppy Up! walk. The walk will start at 10am from the Earth Pet store at 1175 Nw Gilman Blvd Issaquah, WA. After the walk there will be vendors, food, games, prizes, raffles, adoptions, blood drive, local artists and more!! For more information about tomorrow’s event email Earth Pet at earthpetevent@gmail.com and visit the 2 Million Dogs site to find out more about how you can get involved in the fight against canine cancer. Posted in Dogs, Event, Fundraisers, Seattle and tagged Canine Cancer, dogs, Fundraiser. Bookmark the permalink.